I love scarves; they can give a pop of color to any outfit. When I saw the newest trend with the blanket scarf, I knew I would have to try it. I found mine at Walmart for around $10; you can find a similar one HERE. Walmart actually had a huge selection of all kinds of scarves this season at affordable prices. Once I bought it, I had to play around with wrapping it, because it is a lot of fabric, y'all! One way I wore it was wrapping it around my neck like I do with my regular scarves. I paired it with a cream colored sweater, skinny jeans, and leopard print pumps. 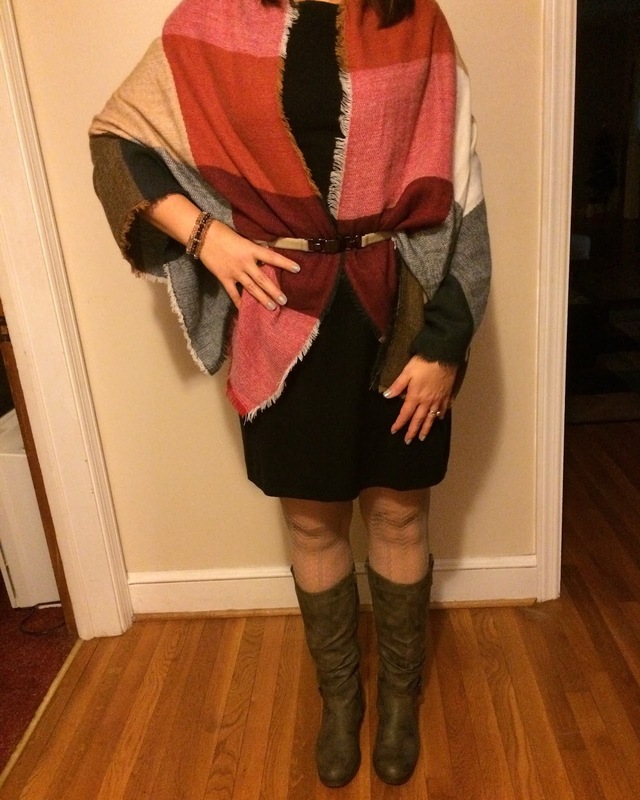 I have also worn it like a poncho and belted it at the waist over a black sweater dress. I accessorized this look with fishnet tights, tall leather boots, and a chunky beaded bracelet. I got a tip from one of the ladies I follow on Instagram about using a rubber band to "tie" the scarf so it hangs down to eliminate all of the fabric around your neck. 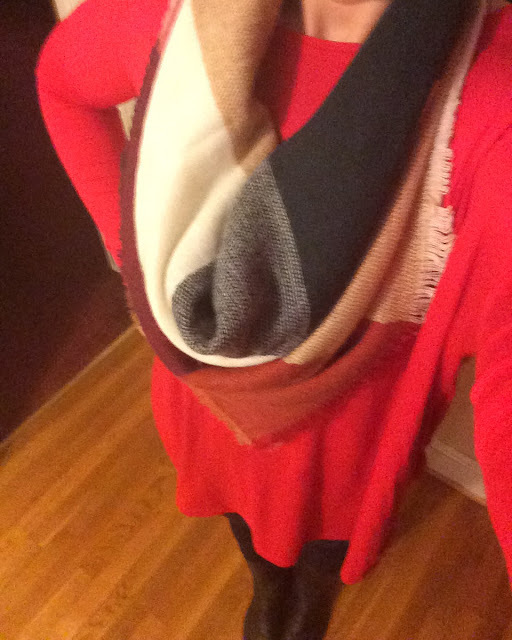 I am wearing it that way below, over a red tunic from White Plum with navy leggings. I have also worn it as a shawl over a chambray button up shirt with red jeggings to stay warm at the soccer field. You can see the other ways I styled these red jeggings HERE. I have seen on Instagram where several ladies have cut their blanket scarves in half, but I am not that brave! 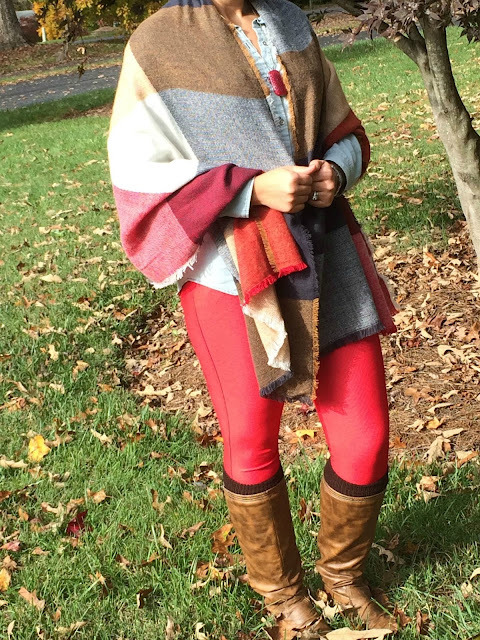 Do you own a blanket scarf? How do you wear it? Oh man. I've never gotten into the scarf trend, but that's only because I lack motivation! I am sure they come in handy once in a while! Sometimes I wish I lived somewhere warm enough where I didn't need them! Thanks for reading! Thank you Melanie! I am happy with it! Love the poncho-like look so much, Mary! Super cozy and so stylish! Wendy, thanks for reading and Pinning! I was so excited to learn about the rubber band trick! It makes the blanket scarves more comfortable to wear. You've really tried some fab ways of styling your blanket scarf. I've been wanting to try mine as a poncho - I think it's a really cool look. Great idea about the rubber band trick - what exactly do you do? Thanks for linking up with Fabulous Friday, Mary. Hope to see you back next week! Thanks so much! I have struggled with how to wear it which resulted in experimenting! Instead of tying the scarf at the back of your neck, you just hold the two pieces together and wrap a rubber band around it (if that makes sense). Your Friday link up is one of my favorites! Thanks Deena! 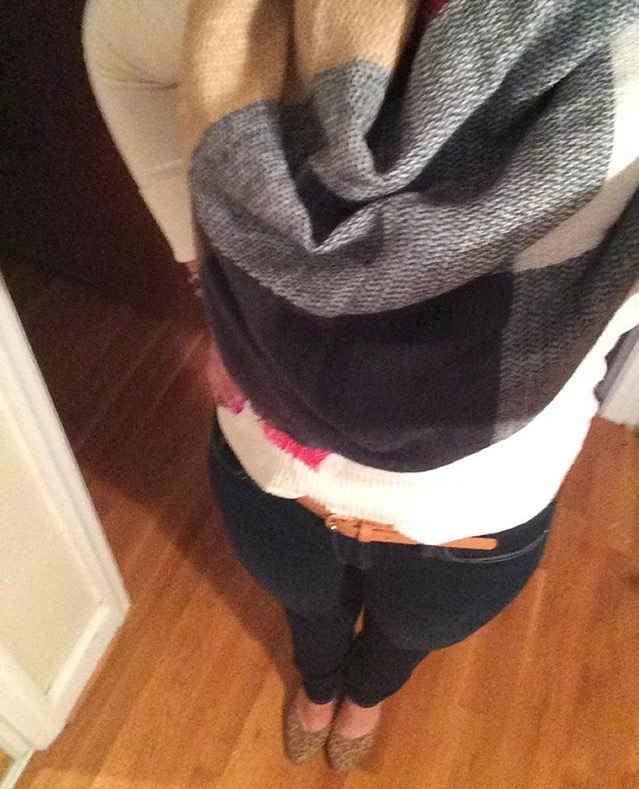 I hope this helps, blanket scarves are definitely harder to style than regular ones! That is the coziest, colorful blanket scarf Mary. I love how you styled it. Chic look for Fall! Thank you for the kind comments! I will be linking up with you for sure!